These Remington .410-gauge shotgun shells are loaded with Remington’s "Slugger" Lead Slugs. The Sluggers are used in multiple shotshells and are known for taking game effectively and quickly. 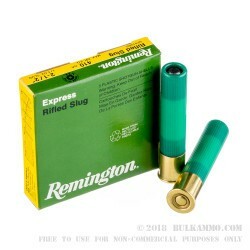 The Remington .410 shotshells that are loaded with a 1/5-ounce solid lead Slugger slugs are measured at 2-1/2" OAL (Overall Length is measured after the shell has been fired, as is standard for shotgun shells). These beastly loads report an impressively fast muzzle velocity of 1830-feet per second, and these shells also have a muzzle energy measurement of 654-foot pounds. These rounds will definitely do the job you need them to do at the range or in the wild on the hunt. 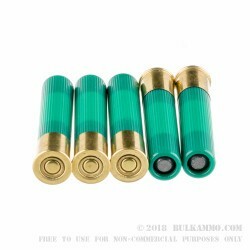 These smaller 5 round Remington Yellow and Green boxes are easy to transport, lightweight, and will fit into your safe or range bag without any problems at all. 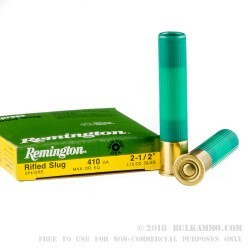 When you are ready to hunt with a great 410 shotshell, and you need to use slugs instead of shot pellets... look no further than the Remington .410 Sluggers. Get yourself multiple boxes and stock your armory up today. The shotgun shell has been a major staple in the world of firearms since its inception. The .410 Bore (.410 gauge) is often incorrectly referred to as a 410 gauge. Calling it a "gauge" is not correct cause the 410 is not measured like a 12 gauge or 20-gauge would be. It is measured the same as many other rounds, by its diameter. The .410 has actually been around since 1857 when it began showing up on the Eley brothers ammo flyers at various General Stores. Jump ahead to 1874 and the Eley Brothers had the .410 loaded as a centerfire shotgun shell. 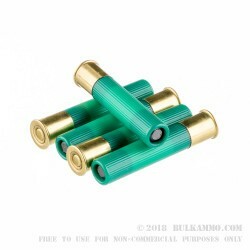 Currently, .410 shells come in a variety of loads such as 00-Buck, 000-Buck, other various Buck shot loads, Slugs, various size pellets made of various materials, and even discs. The 410 has truly become a versatile round, and its growth continues today.